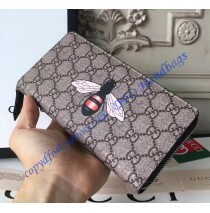 Gucci is known for adding interesting and extra-ordinary motives to their creations at some points. They are used to make a wallet or a bag look special and completely different than anything you have seen ever before. 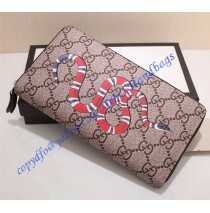 The Kingsnake Print GG Supreme Zip Around Wallet is one of those creations. The Kingsnake Print GG Supreme Zip Around Wallet is made from GG supreme canvas. This material almost doesn’t have an impact on the environment, which made it suitable for people who are eco-friendly and who care about nature and the planet Earth. This wallet comes with beige and ebony canvas, paired with the famous kingsnake motif in the center of it. The trim is made from pink leather, therefore quality and strength are guaranteed. The wallet here looks modern and it is made using the latest technologies. Regardless of the occasion where you need a wallet like this, the Kingsnake Print GG Supreme Zip Around is going to meet your demands and provide you plenty of impressive compliments.